Never weed again! Our small strips of belting are perfect for lying in between garden and plant rows in order to reduce weed growth. These strips will not wear-out and can be used year after year! Our rubber belting can be cut into smaller widths which can be used as easy and affordable way to create a clean line and finish to your landscaping beds and plots. Our materials are easily cut with a utility knife in order to customize length and to get the perfect tailored look for your yard to business. 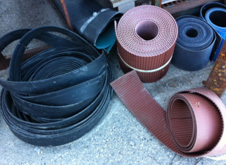 Recycled conveyor belting is environmentally friendly and will not break down over time.